Sometimes I wish for more ports than my microcontroller has. So a while back I purchased an ATMEGA324P microcontroller. This chip is very similar to the 328P in that it has 32K Flash, 1K EEPROM, and 2K Ram, but it has much more I/O available to it. 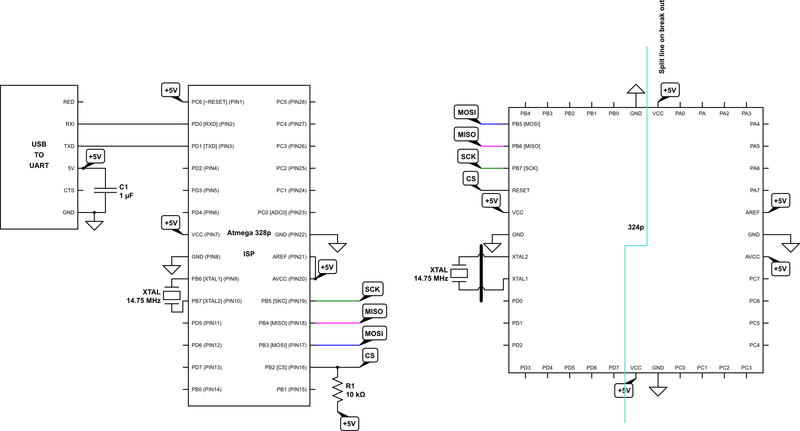 Just compare the pinout. Now the 324P. It's a big 40pin chip... Just look at all that I/O! I do like to use the bootloader though and decided now was the time to see If I could modify the bootloader files to support this baby. I'm happy to say I was successful. Below is a list of all the files I modified to make this happen. First I started with the bootloader328p files. I copied them to a new folder called bootloader324p so the originals remained unchanged. I then proceeded to modify files. This changed the cpu that the bootloader was compiled on to the 324P I opted for a higher speed crystal 18.4320Mhz (the fastest for error free serial coms), and changed the pin to monitor from PB0 to PD6. NOTE: If you do this and intend to use the NK 14.7456Mhz crystal, just leave F_CPU at 14745600. In Makefile.fl, I added a section for the 324p cpu. This was inserted between the 328p and the 32, though I don't think it matters as long as it's in the same section. In uart.h, I changed the elif line for the cpu type to include the 324P like this. I also added an option for the 18.4320Mhz Crystal by adding this to the UBBR value definistions. Which was also successful. I then connected to the serial port of the MCU and the bootloader worked like any other NK chip. Here is a couple of photo's of the base circuit. This is great Rick. 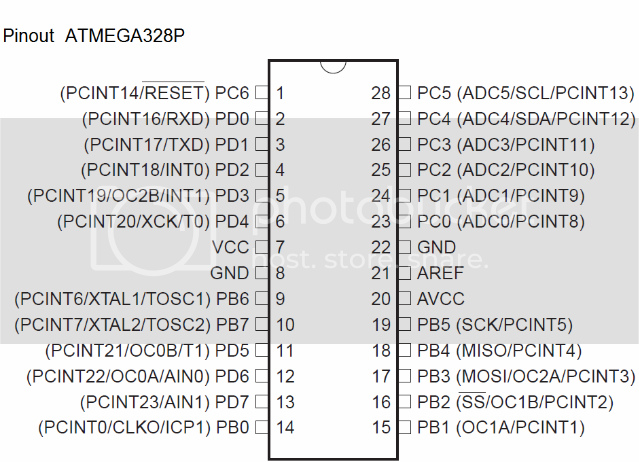 I have a Atmega32 that came with my Atmel Dragon programmer that has the exact same pinouts as the ATmega324P. I'm gonna hafta try this. Of course thanks to your I2C LCD project I have more I/O on the 328p and 168 processors. And then you add Noter's I2C Master/Slave projects and I have all sorts of possibilities. I really like the concept of running multiple parallel processors. I'll bet I can directly use your code changes on the Atmega32. I also have some other "big" processors that I will have to take a look at putting the bootloader on. They will requie some further customization I am sure. Speaking of customizations how in the world did you figure out what changes were required? A lot of the changes are pretty logical but some get rather abstract like changing the extended fuse setting. Once again you have read my mind about projects I'd like to someday get around to doing, thank you. Most of it just came from comparing the related parts on the datasheets between the two. The only thing that took a while to find was the AVR_910 Device code. I found that by looking in the avrdude.conf file. The extended fuse setting is actually the same as for the mega328 except for some reason avrdude reports the unused bits when it reads so even though bits 4 thru 7 are not used they are also not programmed(set at 1) so binary 0x05 (00000101) with bits 4 thru 7 not programmed (11111101) gives you 0xfd instead of 0x05. Same thing only different. I'm not totally sold on the multiple processor thing. I'll admit it is an interesting project and definately has it's applications, but you would have to have a specific need. Just thinking about timing, for a 400Khz I2C bus to send one byte of data to a slave, it has to issue a start condition, then send 8 bits (address), then wait for 1 bit ack from slave, send 8 bit command byte, get ack, send 8bit data, get nack. All total 27 bits sent/recvd just for one data byte to the slave. With a 400Khz clock, that equates to about 60us of time. In that same amount of time, with a 14.7456Mhz clock the cpu could perform around 995 operations. With an 18.432Mhz clock it could perform 1244. Enough operations to do a lot of data output directly on it's port pins with room enough to do other calculations beside. The multi-processor thing is quite useful if your processing requirements exceed the capacity of a single mcu which is not hard to do with these little processors. While it works for simple port expansion, that is more a learning exercise than a real application although you have much greater capability and flexibility than with a simple port expander like the MAX7318. The tradeoff for using multiple mcu's is that it will require more work on the software side. If you have plenty of processor for your application and just need more i/o pins, the best way is to use a larger mcu like the 324p. However, chances are that once you start using all those pins you may begin to run a little short on cycles, particularly if you service high frequency time sensitive interrupts. I experienced less than desirable performance running a 7-seg display, a single external interrupt, related calculations, and data display to both the 7-seg and lcd. Either the interrupt was not serviced immediately or the display jittered. Using multiple mcu's took care of the problem. I'll admit that multi-Digit 7 segment displays cost a bunch of overhead especially if you choose to multiplex them. That's where either your idea of the dedicated processor to do the multiplexing or a dedicated driver ic such as a SAA1064 come in handy. The LCD could be sped up some if it was driven parallel and the read was used to find out when it was ready for data instead of just throwing in dead cpu cycles to wait to be sure. I haven't done the read part to do this, but then again, I haven't really had the need. As for processor power, I never continue to be amazed at what I've seen people do with these little guys and I chalk most of my drawbacks simply to my limited programming knowledge. When I see what some have accomplished, there have been full 8 bit color video games created with the help of only a few external components (the main being the AD725 vidoe generator) such as in the uzebox project. I know B/W NTSC video can be easily generated with nothing more than a few external passive components for simple pong/space invaders type games. Video is very timing dependant yet even with buttons being pressed, video is generated. One other thing, this thread wasn't intended to turn into an extra pins on a cpu vs extra cpu discussion. Both have their benefits and place. Just like the ISP Vs. Bootloader method of programming. I just wanted to share how I went about loading the bootloader onto a different mcu in case someone else wanted to give it a shot. Oh well, threads do take on a life of their own don't they ... anyway I was trying to interest/motivate you to give the multi-mcu a try. Use Eric's or mine or make your own based on Peter's code for fun. As for the bootloader, I initially went through the changes you have outlined but now I have reworked it so everything is contained in a single c source file and makefile. Sure makes changes easier requiring only simple edits to the makefile to build for a different mcu, clock, baud, or fuse setting. No problem. I may give the multiple mcu thing a shot when the time comes. So far though, I'm having fun just figuring out things like putting the bootloader on a different mcu. I've also been playing around with latching octal buffers to see if I can make a different type of driver for an LED display that would make better use of processor cycles. (Think parallel shift register) My thought with this if it pans out would be to create a display that is 40 x 8 that would fully draw in only 48 - 56 shifts. 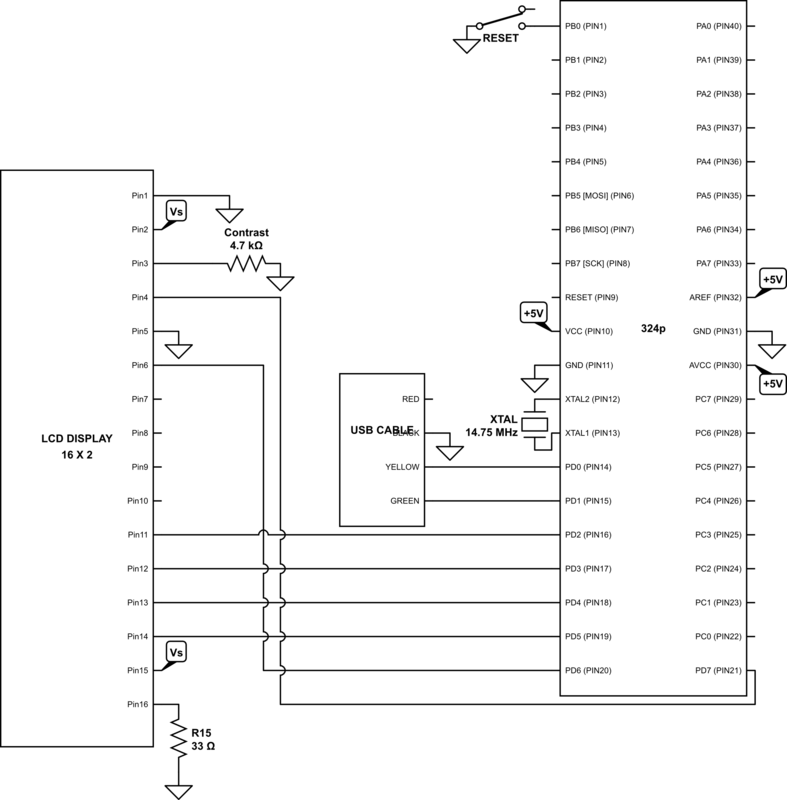 Still working on the schematic and logic but that was the reason for the bigger chip. It has more than one full 8 bit port that is not tied to the serial or crystal etc... With a single cpu instruction you can write all 8 bits to a port which should save time. If it works out, this will be a hint of things to come... if not... You probably won't hear about it again :D.
When I tested with the NK usb-serial cable, it couldn't make connection to the MCU. Could it be the fuse setting? I have triple checked my hardware connections. PD6 is connected to GND when using NK usb programmer. Man, this is so frustrating. I'm not quite sure what went wrong. It seems you made appropriate changes for the 644 vs 324. I looked up your fuse settings and bootloader address, they all seem right. I don't have a 644 to try it on. Have you tried using the makefile as I did instead of going through avrstudio? Maybe somehow it's loading the bootloader into an incorrect location?? after reading your reply I scrolled up the page and check your wiring and noticed there are two Uarts. GUESS WHAT I DID WRONG? and I happened to plugged the NK cable to the second one which was not programmed to work. Haha, it works fine now with the first uart set (PD0 and PD1). This will disable JTAG and allow me to use those 4 I/Os And note: must not enable WDTON or else the chip will constantly reset it self!!! To redo the fuse, I had to erase the chip. Take it off the breadboard and put it back on. Upload the foodloader.hex, set the fuses, and lock. Then it is ready to be use. Anyway, I'm glad you got it working. I'll most likely have to make the fuse setting changes as well. I had noticed the JTAG but didn't read enough to realize it would steal pins for it's use. Kelvin, make sure and let us know when you get the boot loader on the Atmega32. Oh yeah, by the way, you can find out the exact signature of your mcu by using the avr studio 4 read signature function. Back to topic. Actually, it requires less work to get the Atmega32 bootloader on because the signature and dev_code is already written in the codes. 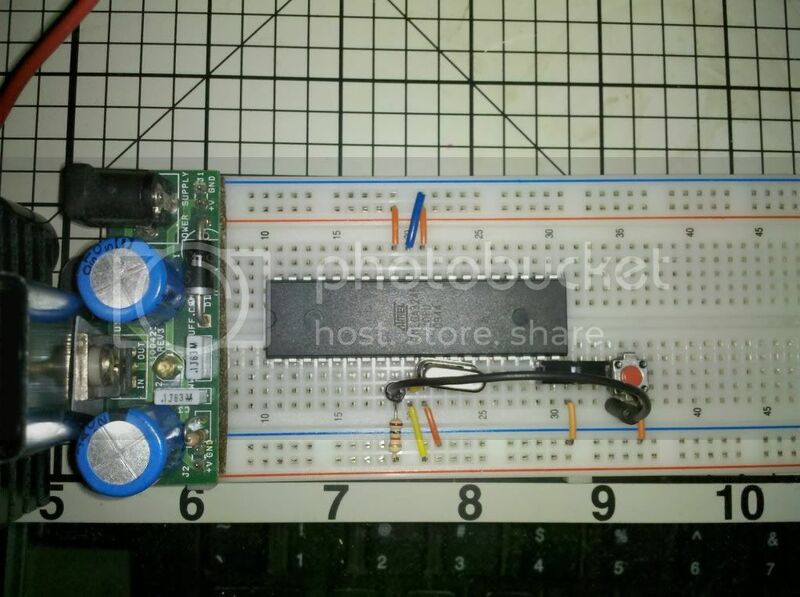 The Atmega32A support usart which means that it can support synchronous or asynchronous. Nevertheless, the PIN configurations are the same for RX and TX so u don't have to worry about it. Just follow Rick's instructions for general guideline. The trickiest part is the fuse setting. I actually messed up one of my atmega32A during the fuse setting (now I can't access it with a regular avrisp so I'm working on the avr Dragon trying to get it fixed). However, on my second attempt, I got the fuse setting to work. If you are using avr studio 4 like me (so much easier to navigate)to set the fuses and lock, make sure to pick the atmega32 chip version in the drop down box. I will post the exact Hi and Lo setting once I get home from school. Maybe I will post pictures too explaining the how avr studio fuse setting work. In summary, I use the cmd to make -f Makefile.fl to get the fooderloader.hex after changing the target to atmega32 (not atmega32A since they are the same*). I use avr studio 4 to upload the fooderloader.hex then I set fuses then I set the lock. Thanks Kelvin, this is great, course like Rick it'll will probable be in the winter time before I get around to implementing it. Hey, if you've never flown an RC helicopter before, you have no idea how much "work" it is. Wow a 130' brick path... you have a lot more energy than I do! Have you ever thought of working on a quad-copter? But yeah, MCU is very addictive kinda like alcohol. Actually I have been fascinated with RC since I have started with the Nerdkit it just seems as if a micro controller is a natural fit. I really would like to be able to play um or work with a RC Plane or especially a helicopter. I have a neighbor who builds some of the most fascinating RC planes. I definitely have RC on my list of things to do. I have a bad habit of obsessing with my hobby of the moment. I've thought of a quad copter, but really like the challenge of learning to fly a real RC copter. Believe me when I say, it's not as easy as it looks. But I've always enjoyed a challenge. I gotta say this has been an excellent thread! Rick, I'm very impressed with the way you've presented your findings and the results. I'm embarking on trying this one myself, mainly for the 2 uarts. i saw your thread and figured this would make it a whole lot easier, so THANK YOU. I finally got a chance to try the new chips tonight and I'm proud to say the bootloader was installed very easily and the whole thing went off without a hitch. I applaud you again, great work! I'm glad it worked out for you. I kind of figured when I did the write up that I wouldn't be the only person who might want to do this. make: Leaving directory ........ i.e. the same as kelvin. 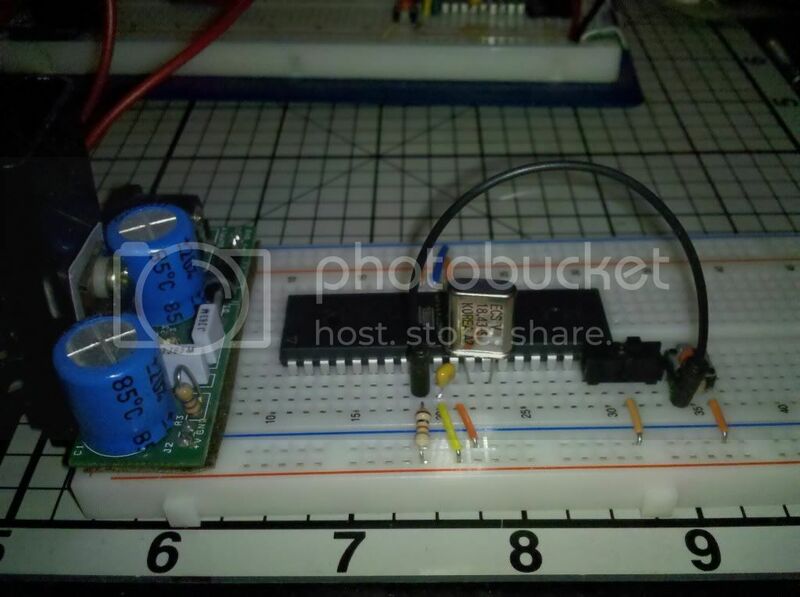 Ive attached an image of my breadboard set up. This is the first time ive tried to install a new bootloader so i have no idea how to trouble shoot it. i have checked the power supply to the breadboard and that seems to be ok. and i had a bit of difficulty installing the USBasp driver onto vista but i eventually did that as well. now im stuck for ideas. Did you delete foodloader.o and foodloader.hex from the folder? Also, when using the USBASP on a new microcontroller, you will need to add the jumper for low speed clock at least until the fuses are set. (I think it's J1 on most USBASP boards) If you are supplying external power make sure the USBASP power jumper is not installed. If you are using the USBASP for power make sure it is installed. Do not use both at once. I have just deleted those two files and tried the make -f Makefile.fl command again and i got this! Dont even know where to star. As for the jummer im not entirely sure what you mean. i have connected the reset cable from the circuit board to pin 9 and have added a 10k resistor. ive checked to see if the circuit has power from the usbasp and it does. The 324A and 324P most likely have different signatures. You would have to change everything that references the 324P with the correct data for the 324A. I'm at lunch at work right now so I can't look things up. If I have time, I'll see if I can find the right info for that mcu. Here is a list of the signatures for the A PA variants other than the one I listed at the top. Isn't, at least part of the problem, occurring farther up the chain? In the uart.h and the config.h files isn't the 'if statement' that has the specific defines for the particular processor in error? I think that is where the "this cpu is not supported yet!" errors are coming from? You would have to change everything that references the 324P with the correct data for the 324A. I'm at lunch at work right now so I can't look things up. I was just giving him a place to work with until I get home to provide more. I did read that your previous post, but in your post with the 'signatures' there was no further mention of that. I was just making sure that there was an error that occurred previous to that point so "kemil" wouldn't think that the signatures should fix the issue. Jim, - I apologize for the nip - I can be a bit rude sometimes and that was one of those moments. I didn't go into detail at that time because I was at work and didn't have enough time to really get much farther for him. I'm home now. I just did a quick check and while most of the settings will be similar, there will be one somewhat major issue. AVRDUDE doesn't support the 324A variant. So any programming that you would want to upload to the chip with avrdude, would have to be forced to ignore the signature. I don't know how advanced you are kemil, but while this can be done, it would not be the "cleanest" of solutions. The easiest, would obviously be to get a 324p. Let me know what you plan and at what level you are at, because this could get a little deep. Essentially what has to be done is you would have to go through the datasheet for the 324A and glean all the info relating to each of the file modifications I did above for the 324p. You would have to make sure to add the -F option with the arduino flags to override the signature check. Another option is to just use your usbasp to program the chip and avoid adding a bootloader altogether. You would just compile your programs to a hex the send them over with the usbasp instead - again though with avrdude you would need the -F.
Thank you very much for taking the time to help me, i really appreciate it. I dont think im skilled enough to take on the task of reconfiguring everything for the 324A. 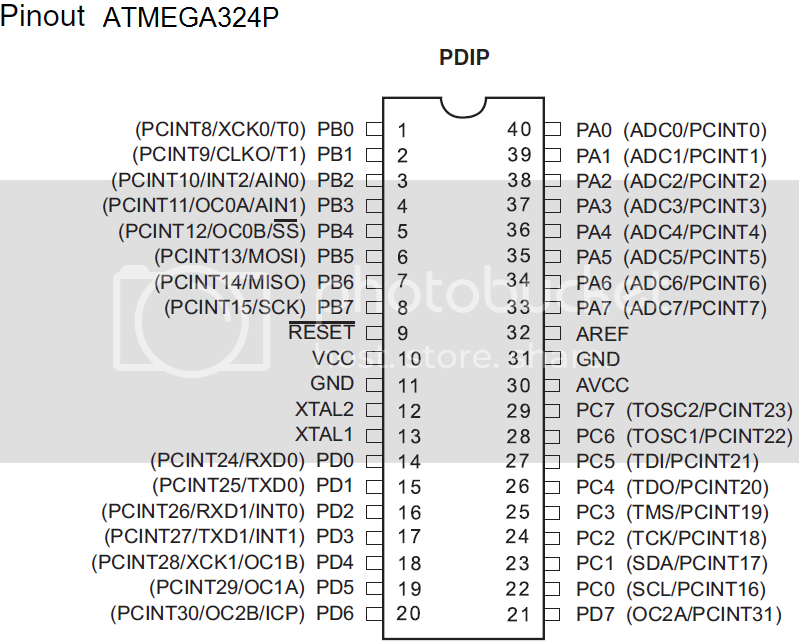 Instead im going to buy the ATMEGA324P-20PU and pray that i can get it to work!. I think that will be the easiest solution for you. While you are waiting for your part to come in, you can modify the files to make sure you get past the errors. Of course you could also get a programer and load your programs directly eliminating the need for a boot loader!! I like the Atmel Dragon but there are lots of other programmers. I'm trying to get on board with the 324p but don't have a 'programer' to bootlaod it. I'm wondering where if at all the My Nerdkit is an ISP Programmer fits in? I have bootloaded a 328p and programed a ATTINY85 which I'm happy with, now I just need to get a handle on the big boy. If you are using a 324P micro, you can download the folder with all the modified files I used from my website at http://rs-micro.com/files/bootloader324P.zip the compiled bootloader, and modified makefiles that worked for me are in the folder. Now when I use the same delay.h file (well a copy) with a 324p, the delay_ms() runs at half speed, I have messed around with the clock fuses with no luck. Is there something I'm missing? Clock divide by two fuse, or maybe the delay functions are different (like is a NOP a NOP for all microprocessors)? I can load program through UART with the Nerdkits cable so it seems that the clock is working fine. I'm almost there, thanks everyone. If your clock is set the same, the delays should be the same as I recall. Did you use the files I offered to set your fuses? I think there is something going on with NOP or 'Parallel Instruction Fetches' vs 'Single Cycle ALU Operation' discuses on page 15 of the 328p data sheet. Anyway other things seem to be working fine, and delay functions aren't the best way to code anyways so I'm happy for now. although I had an AC accident on my bread board and toasted my original NerdKits LCD. I have double checked all my connections I'm Think I'm over looking something very obvious like the chips are not exactly the same as each other. Any thoughts? Ok so there is I bought the 324PA vs the 324P, the differences seem tiny. I got the 324PA working I think I'm going to stick with that style. 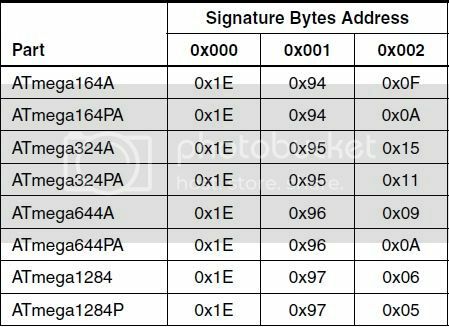 Did you check the signature bytes? Likely different between the two. Most are very easy to check with a logic probe or oscilloscope, and if you ensure the above items are correct, the chip and programmer must communicate. Depending on how the fuses are set, if the QFP is new, you might be able to put a scope on the clock output in and see if you get a signal-- which will tell you the chip isn't just dead.